"We've provided an unprecedented understanding of how a glacial earthquake evolves," says Emory physicist Justin Burton. 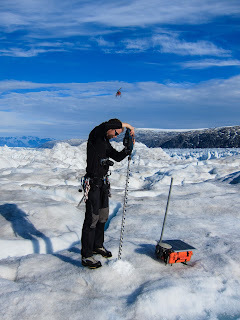 The research focused on Helheim Glacier in Greenland, above. Photo by NASA/Jim Yungel. When a massive iceberg breaks off from the front of a glacier it can fall backwards, slamming into the glacier with such force that it reverses the ice flow for several minutes and causes it to drop, producing an earthquake that can be measured across the globe. The journal Science is publishing the discovery, including detailed documentation of the forces involved in these iceberg calving events and an explanation for the causes of glacial earthquakes. The research marks a major step toward the ability to measure the size of iceberg calving events in near real-time and from anywhere in the world. 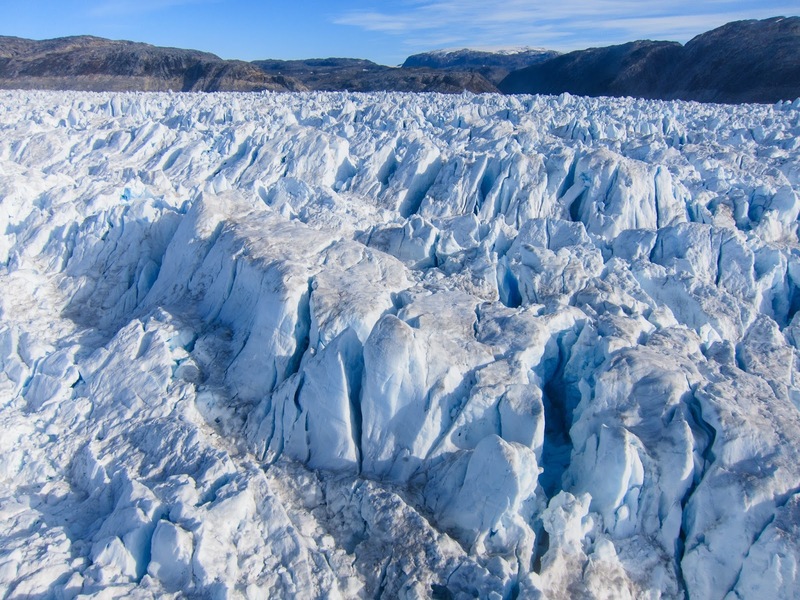 The study, which focused on Helheim Glacier in the Greenland Ice Sheet, also included scientists from the universities of Swansea, Newcastle and Sheffield in the UK and the universities of Columbia and Michigan in the U.S. The Greenland Ice Sheet is disappearing at a faster rate than Antarctica, and shows no sign of slowing down. As much as half of that loss is due not to melting, but to icebergs breaking off and discharging into the sea, a process known as calving. As sheets of ice taller than a New York skyscraper fall over and collapse into the water they release energy equivalent to several nuclear bombs. In 2003, scientists discovered the existence of glacial earthquakes. They knew that iceberg calving caused these quakes, but it was unclear why. A regular earthquake originates from stress building up from deep within the Earth, which then gets released suddenly. A glacial earthquake, however, originates on the surface and happens in relative slow motion, during the 10 to 15 minutes it takes an iceberg to flip 90 degrees, collapse into the sea and generate waves of energy. The study authors wanted to gain a better understanding of the processes involved in collapsing icebergs and how they cause glacial earthquakes. Tavi Murray, a glaciologist from Swansea University, led the field portion of the study. 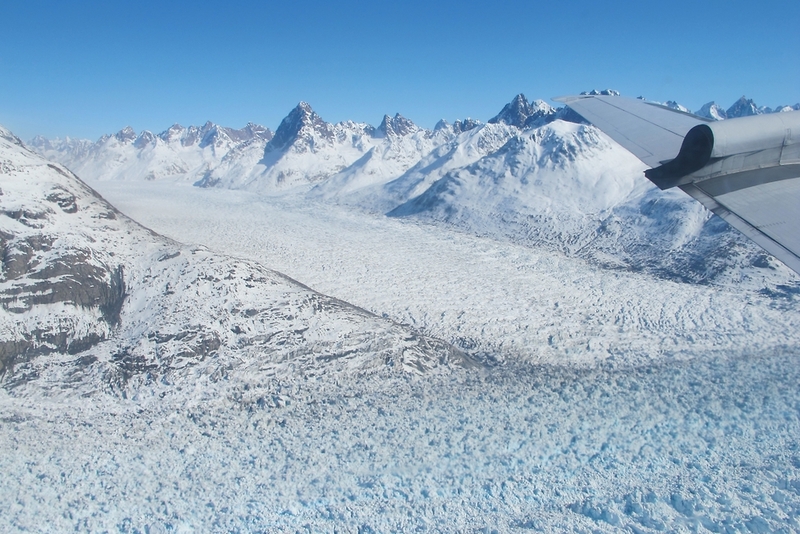 During the summer of 2013, researchers from Swansea, Newcastle and Sheffield universities flew over Helheim Glacier in helicopters. They installed a sophisticated network of Global Positioning System (GPS) devices on the glacier’s surface to record movements of the glacier in the minutes surrounding calving events. The Greenland Ice Sheet is getting smaller. If it melts entirely, scientists estimate that sea level will rise about 6 meters (20 feet). Photo of Helheim Glacier by Nick Selmes, Swansea University. One of the surprises revealed by the resulting data was that some of the calving events actually reversed the flow of the glacier during a glacial earthquake. Burton led a laboratory modeling portion of the study, along with Mac Cathles, who is now at the University of Michigan. They built a rectangular, Plexiglas water tank as a scaled-down version of a fjord. Rectangular plastic blocks that have the same density as icebergs are tipped in the water tank and the resulting hydrodynamics are recorded. The analysis phase also drew from the expertise of co-author Meredith Nettles, a seismologist at Columbia’s Lamont-Doherty Earth Observatory, and data in the Global Seismographic Network. The collaborative analyses and experimental modeling allowed the researchers to tease apart all the forces responsible for the motion of the glacier, recreate them in the lab, and solve the mystery of how glacial earthquakes work. “We were able to explain the motion of the GPS sensors by tracking all the forces that affect the glacier during iceberg calving, providing an unprecedented understanding of how a glacial earthquake evolves,” Burton says. They found that many of the calving icebergs are falling backwards, slamming into the face of the glacier before they collapse into the sea. The front of the glacier gets compressed like a spring, temporarily reversing the motion of the glacier and generating the horizontal force of a glacial earthquake. As the iceberg hits the water, it rapidly reduces pressure behind the rotating iceberg. This dramatic drop in water pressure draws the glacier down about 10 centimeters, while pulling the Earth upwards, creating the vertical force seen in the seismic signature of a glacier earthquake. Glacial earthquakes are globally detectable seismic events. The researchers hope their detailed documentation of the forces at play will help interpret the remote sensing of calving events, which are increasingly occurring at tidewater-terminating glaciers in Greenland and Antarctica.